This page will walk through Angular valueChanges and statusChanges properties of FormControl, FormArray and FormGroup classes. valueChanges and statusChanges both return Observable instance and we can subscribe them to get data. valueChanges emits an event every time when the value of control changes either using UI or programmatically. statusChanges emits an event every time when the validation status of the control is recalculated. statusChanges gives current validation status of a control. valueChanges gives current value of a control. valueChanges can be used for conditional validation in reactive form. Here on this page we will create a reactive user form and provide examples for valueChanges and statusChanges using FormControl, FormArray and FormGroup classes. valueChanges is a property of AbstractControl that emits an event every time when the value of control changes either using UI or programmatically. valueChanges property is available in FormControl, FormArray and FormGroup classes because they inherit AbstractControl class. valueChanges property has been declared as following. We can see that it returns Observable of any type. We can subscribe valueChanges to get data. 1. If we subscribe valueChanges of a FormControl instance, we get latest value of that control whenever there is any change. 2. If we subscribe valueChanges of a FormArray instance, we get latest value of those array controls whenever there is any change. 3. If we subscribe valueChanges of a FormGroup instance, we get latest value of the form controls whenever there is a change in any control of the form. statusChanges is a property of AbstractControl that emits an event every time when the validation status of the control is recalculated. statusChanges property is available in FormControl, FormArray and FormGroup classes because they inherit AbstractControl class. statusChanges property has been declared as following. The return type of statusChanges is Observable of any type. 1. If we subscribe statusChanges of a FormControl instance, we get latest validation status of that control whenever validation status is recalculated for that control. 2. If we subscribe statusChanges of a FormArray instance, we get latest validation status of those array controls whenever validation status is recalculated for those array controls. 3. If we subscribe statusChanges of a FormGroup instance, we get latest validation status of the form controls whenever validation status is recalculated in any control of the form. 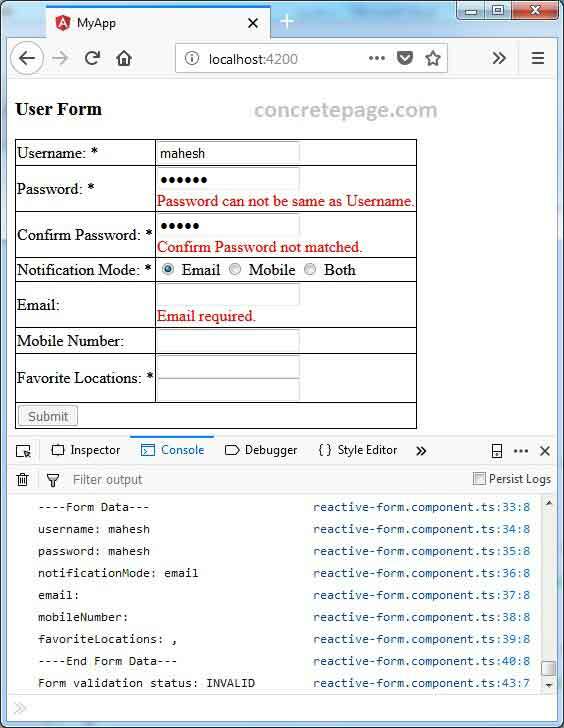 We will create a reactive user form for our demo using FormBuilder. Then we can call valueChanges as given below. Above code will execute for every time whenever username control changes. Above code will execute for every time whenever favoriteLocations control changes. Whenever there is change in value in any control of the userForm, above code will execute. Then we can call statusChanges as given below. The above code will execute whenever the validation status of username is recalculated. Above code will execute if validation status of favoriteLocations is recalculated. The above code executes whenever the userForm validation status is recalculated. We can perform conditional validation using valueChanges property in reactive form. For the demo, suppose we have password and confirm password fields in our user form. The confirm password must match with password and if the value in password field changes, the confirm password must be recalculated. confirmPasswordValidator is a custom validator that validates if password and confirm password are matched or not. Password can not be same as Username. In our demo application, whenever there is any change in value and validation status of form controls, we will see logs in console. We have created some conditional validations in our example and that are Username and password cannot be same, password and confirm password must match. We need to select notification type and accordingly we are required to enter data in email or mobile number or both fields. We need to enter favorite locations. Whenever we enter or delete data in form controls, we will see output in console for their current value and validation status.